This butterfly we believe to be an Eastern Comma was taking a rest just outside our front door Saturday night as we left for supper. 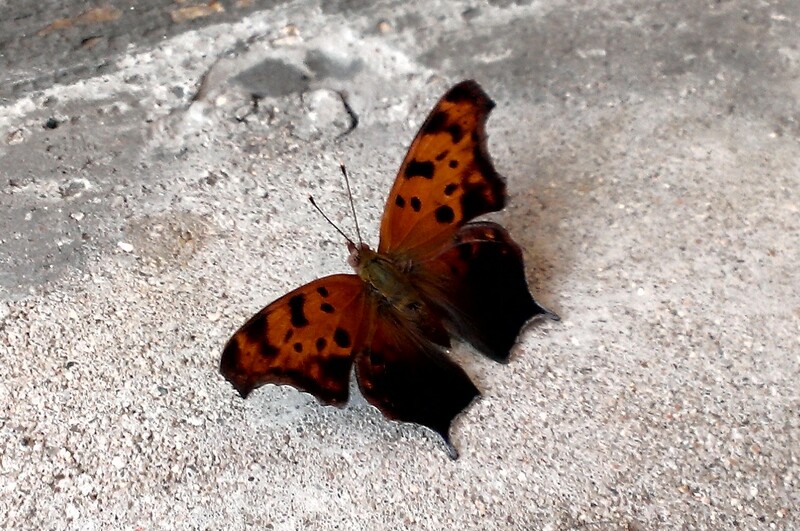 (S)he waited very patiently until I had captured the photo I wanted and then fluttered off. Coming to Jesus, falling "At the Feet of Jesus" is where I have needed to start my days lately. So if you're looking for me today, look for me "in the shelter of my Savior’s embrace /Hidden safely in the refuge of His mercy and His Grace/And I Will Sing Hallelujah to the One who sets me free/And you will find me in the arms of Jesus" (Steven Curtis Chapman, "At the Feet of Jesus," The Glorious Unfolding). Perhaps another Crumble needs to hide in His refuge too? May you have a truly restful weekend, my Crumble friends.